A new display for past tribes has been added, along with the ability to change alliances and relationships weekly. These features are available on the five BrantSteele.com Survivor simulators. The next Survivor update will contain logic improvements and more display changes, along with a new secret advantage system. This update may be broken into multiple parts. The internal structure was changed behind all 5 of these seasons, so there’s a high likelihood for bugs, especially for Ghost Island and David vs. Goliath. Please list any you see, and I’ll list the ones that are fixed below. Thank you. You might have to close and restart your browser to see some of the CSS could be cached and needs refreshed. S34 & S36: Exiled players return to the correct tribe in the event of a medevac. S35: Merge targeting threats, not weak players. S36: Ghost Island explained in merge episode. S33-S37: Wrong cast members displayed in the final three while using Weekly Changing Relationships. S33-S37: Fixing the above bug caused an issue with fan favorite, which was fixed without causing any additional bugs. S33-S37: Fixed issues with targets only displaying on the active episode you are simulating, for weekly changing relationships. S34: Only one tribe should be shown winning immunity in episode 4. S34: Episode 8 now shows individual, rather then tribal immunity. S33-S37: Tribal rewards after swaps were showing the past tribes winning. 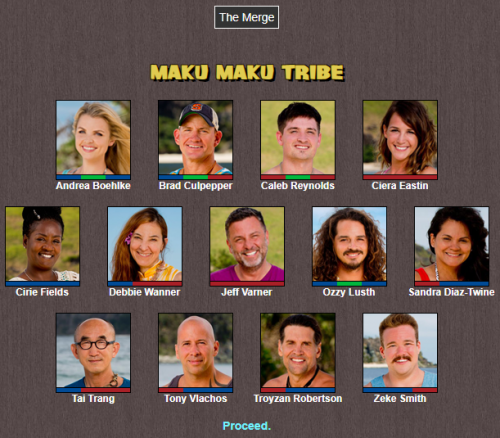 Palau: Name of merge tribe appearing as <> resolved. S36: Navigation links fixed in episode 10. More special characters are now allowed in season names, tribe names, and player names/nicknames in all of the BrantSteele.net simulators. Original Survivor: Tribe names should no longer turn to lowercase in edit cast. Micronesia, Tocantins, Cagayan: Rare winner display bug showing false tie fixed. Survivor Fiji: Fixed finale episode navigation. Survivor Panama: Fixed the finale reward challenge. Keep reading for more details about the latest Survivor changes. In order to Change Settings Each Episode, ‘Enable’ it on the first page of each simulated season. You must then select “Proceed” before advancing through the episode. You will need to “Proceed” through each additional episode after you’re satisfied with the relationships and alliances. The display options have been moved to the right sidebar. These options can be changed without having to re-simulate the whole season. This is a sample with Tribe History set as Colors. You can also use the names, like past .net seasons, or turn off tribe history display completely. Thank you for continuing to simulate. In Tribal Council of the merge episode, colors features only reflects the tribes that the contestants were originally on and does not reflect any tribal swaps. The Final Tribal Council of the season has a random F3 and Jury which do not reflect the actual F3 and Jury. I am so excited for all of these Survivor updates, you’re the best! Can’t wait to see what’s to come! 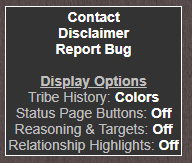 Thanks, tribal council was one episode behind with the tribe display and should be fixed now. I’m still trying to figure out the final tribal council issue you saw. Were you using “Change Relationships & Alliances weekly”? Yes, it was when was “Change Settings Each Episode” was enabled. The actual winners of the season as reflected on the rankings were correct but the contestants who appeared in the voting and tribal council, etc., were scrambled. I am so glad you reported that. I had something fundamental in the wrong order, so you were seeing results from the previously simulated season there until you chose the fan favorite. I fixed the ordering, which broke fan favorite, so I fixed that, and now I believe it should work. This was a major issue, and I thank you for the details on it. Are we going to put the target and relationships settings up or no? For HvHvH, after the tribes switch up for some reason the original healer tribe won reward which does not even make sense since they have swithced tribes. I made a very simple mistake, sorry. Fixed now. Thanks for reporting it. Can you upload Hell’s Kitchen S18 Cast? I think this would be an easy screen flow fix! Hope this made sense. Thank you! Can yall add cast pics from other shows? There are so many that are easy to find. Examples are Ex On The Beach USA, Apprentice (non celeb), Project Runway, Love Island, and this is a long shot but, The Bachelor? I think it would be cool to have a lot more cast pictures from shows that I know people who use this site watch. Jessica finds the david tribe idol. So when they switch tribes david tribe turns into vuku tribe. And then for some reason gabby finds the vuku tribe idol which jessica already has the david tribe idol. Which david tribe is vuku tribe. The vuku tribe idol was hidden in the swap but the tiva tribe idol was not hidden.